One of our biggest learning curves when we began cooking and experimenting in the kitchen was finding a way of making a meal out of nothing. Being ultra busy and in a fast-paced city, we often feel like we spend all our time living to work rather than working to live, so there’s usually a night (or two) a week when coming home and finding nothing in the fridge or cupboard suddenly welcomes the temptation to order a takeaway. We got to thinking of staples most households always seem to have – bread, onions, milk, dried herbs – and started devising recipes using these as a base to keep at arm’s length for when you have little energy, inspiration, or when it’s a particularly tight week. 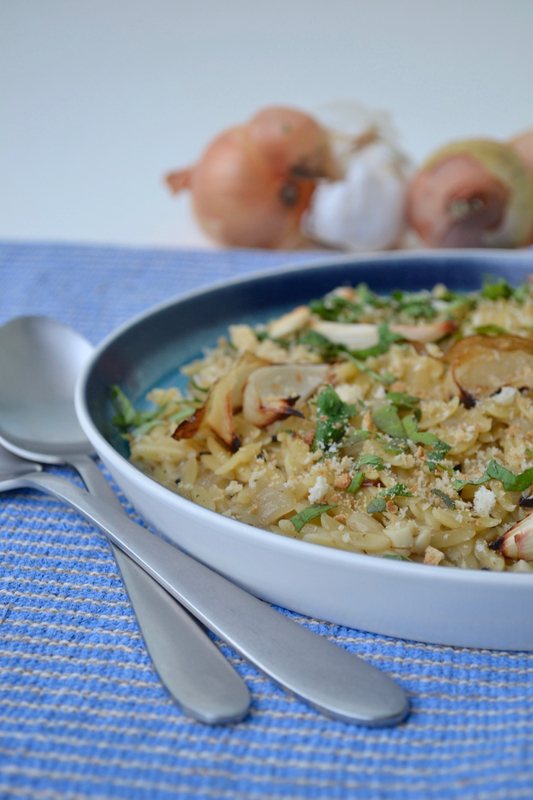 Orzo is the Italian word for ‘barley’, yet is in fact a pasta, though it looks like a rice. (Confused yet?) 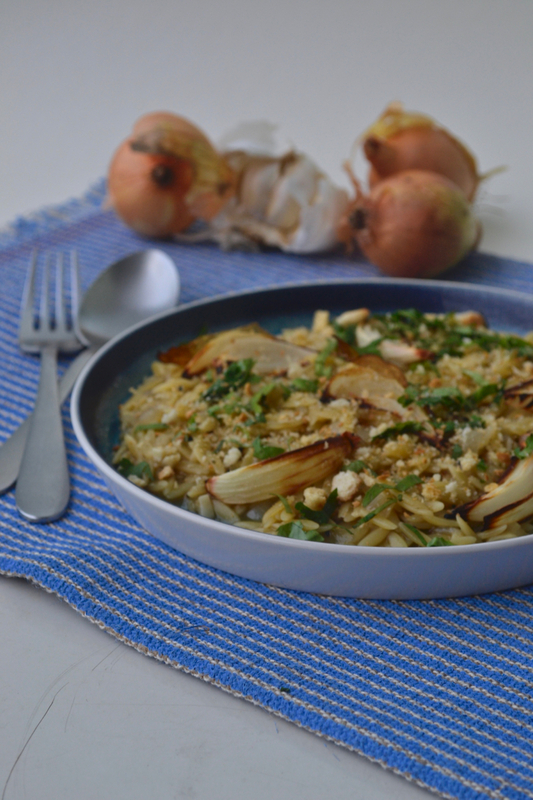 It’s a real cupboard essential for us as it needn’t be stirred and watched every minute like risotto would, but cooks the same way and has a similar outcome in taste and texture. This recipe isn’t dictated by season and requires such minimal effort for a super rich pay-off. 1. Pre-heat oven to 170°C and chop one onion in half, then each half into quarters, before baking on a lightly oiled sheet with two of the garlic cloves, left in their skin, for 15 minutes. 2. Meanwhile heat a saucepan on medium-low and melt butter until it’s foaming, finely chop the other onion and garlic and fry them, low and slow, for about 10 minutes. Then, add in the sugar, salt, pepper, seeds and spices, stir well and allow to cook down a further 5 minutes. 3. You can make the stock as they cook by dunking the stock cube into 500ml of recently boiled water and whisking to incorporate. Fresh is always best for a real rich flavour, but if you don’t have it don’t worry. 4. 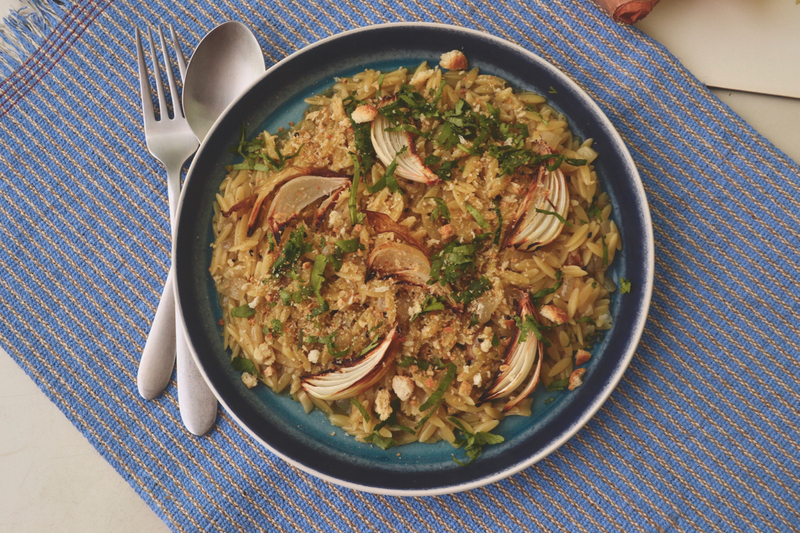 Once the onions and garlic are softened well, crank the heat up to medium-high and introduce the orzo to the pan for 1-2 minutes, stirring until fully slicked. 5. Add all the stock at once and wait until it comes to the boil before turning down to the lowest heat, then leaving to cook with the lid clamped on for 12-15 minutes. Give it a check and a stir once or twice, checking until the stock has been almost entirely absorbed, then take off the heat. 6. Take the vegetables out of the oven, remove the garlic from their skins and mash the flesh, now sweetened and subtle. Break down the bread into coarse breadcrumbs in a food processor (or with a box grater) and then spread out in one line on a baking tray in the oven, same temperature, until crisped and lightly golden. 7. 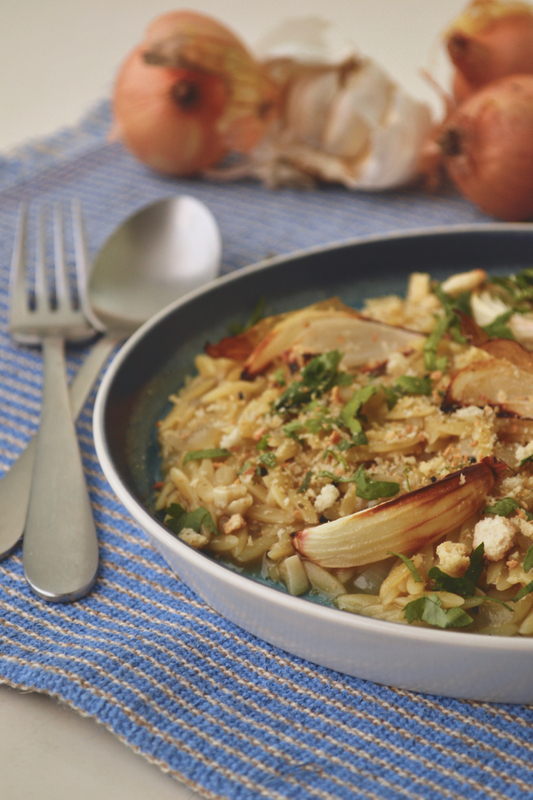 When the orzo is done, stir in the mashed garlic. Taste for seasoning and plate up, strewing the roasted onions over the top, followed by chopped fresh coriander and then finally the breadcrumbs. 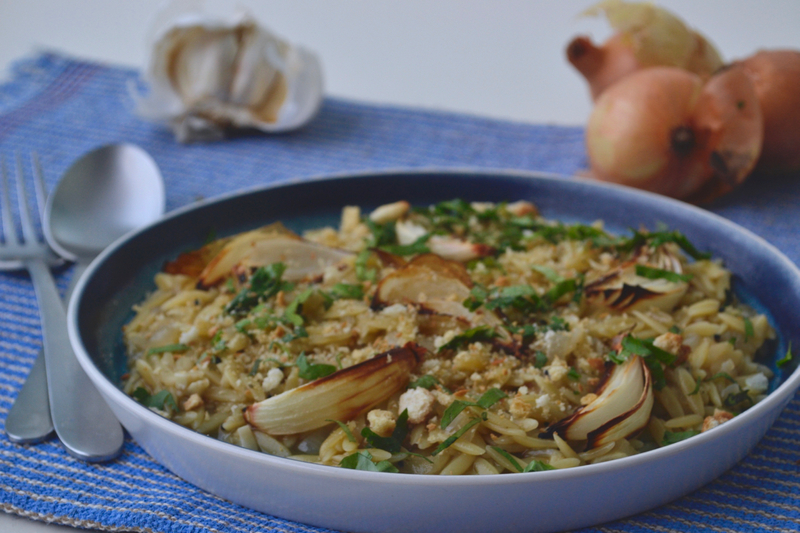 This recipe for orzotto originally appeared in Gay Times Magazine, where we’re the food columnists with a monthly recipe. Do follow GT on Twitter, Facebook or Instagram and subscribe to the magazine if you like!